Your dedicated team. Our years of experience. Your return on investment. Our Difference. Our expert team have helped businesses to successfully outsourced thousands of tasks, functions and processes and have helped businesses to save millions of dollars through improvements in efficiency and quality. Let us wrap the full capability and experience of hammerjack around your team. First and foremost, our managed solutions have been developed to drive performance and deliver results. There are no one-size-fits all solutions, and all are developed around your objectives. No one knows your business like you do and no one gets results like hammerjack. 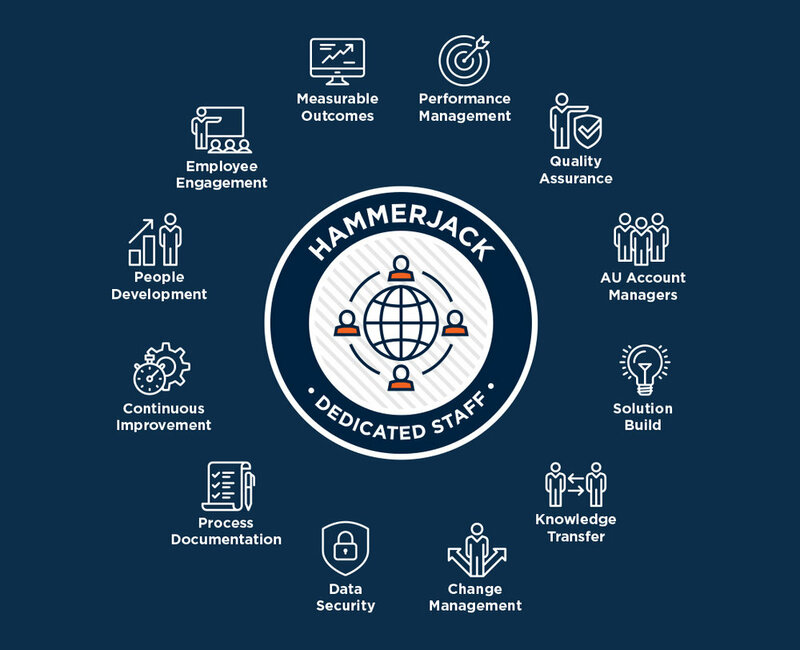 Although hammerjack are responsible for managing the performance and delivery of your team, you and your stakeholders will interact with your team and have direct access to our senior management team and other support resources. Essentially our experience management and support teams become your resources too. Imagine having your own onsite management, a training department, your unique processes documented and managed by an expert change management team. With hammerjack, you do. Getting results offshore takes structure, governance and years of experience. We have invested heavily in the support and management structures, frameworks and governance to ensure the success outsourced team or function. With our experienced team behind your outsourced functions your capability will flex and grow as the demand on your business grows. Most importantly you will see measurable returns on your investment through performance driven to agreed metrics and outcomes. Your business growth and success of your outsourced and offshore operations is only a click away.